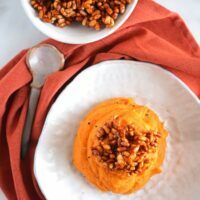 These Sweet Potatoes with Crispy Rice Topping is a fun and unique way to serve your sweet potatoes at your Thanksgiving table this year! I started off by making a caramel sauce on the stove top. Then I poured the caramel on top of the rice cereal and quickly gave it a thorough tossing, making sure all the rice cereal is covered in tasty caramel sauce. Next, set aside to cool before breaking into pieces to serve. While the crispy rice topping was cooling I started on the potatoes. Buy small sweet potatoes so they will roast quicker in the oven. Planning is a must when prepping Thanksgiving dinner. 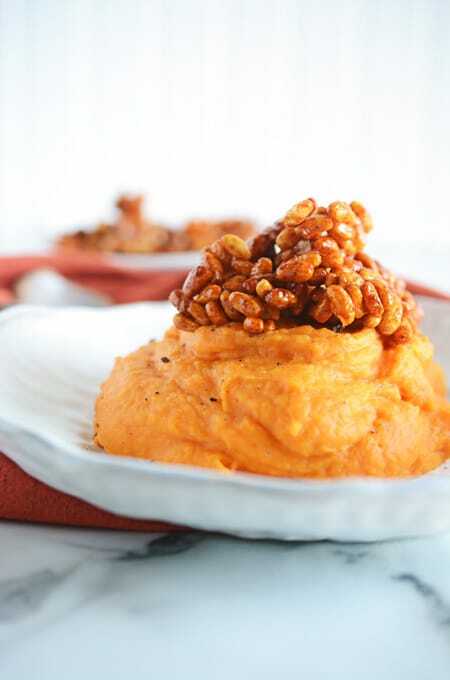 The pureed sweet potatoes can be made 2 days ahead of time and refrigerated. 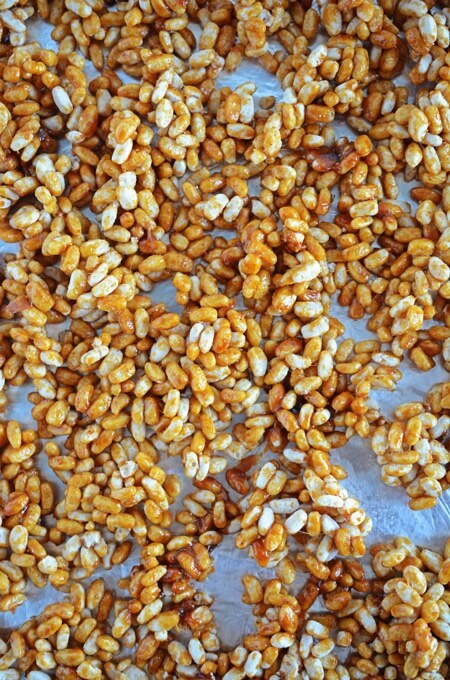 The crispy rice topping can be made up to a week in advance and stored in an air tight container stored on the counter. Here are a few other Thanksgiving treats you might want to feature on your Thanksgiving table this year: Classic Pecan Pie, The Quintessential Pumpkin Pie, Easy Pumpkin Parfaits and maybe have some Thanksgiving breakfast with these Spiced Pumpkin Pecan Pancakes! Be sure to follow The Cake Chica on social media: Facebook, Instagram, Twitter, Pinterest and Yummly. If you’re looking for more, sign up for my weekly newsletter The Weekly Recap where I’ll send one email per week to your inbox with the latest recipe link and a sneak peek at what’s coming up next on The Cake Chica. 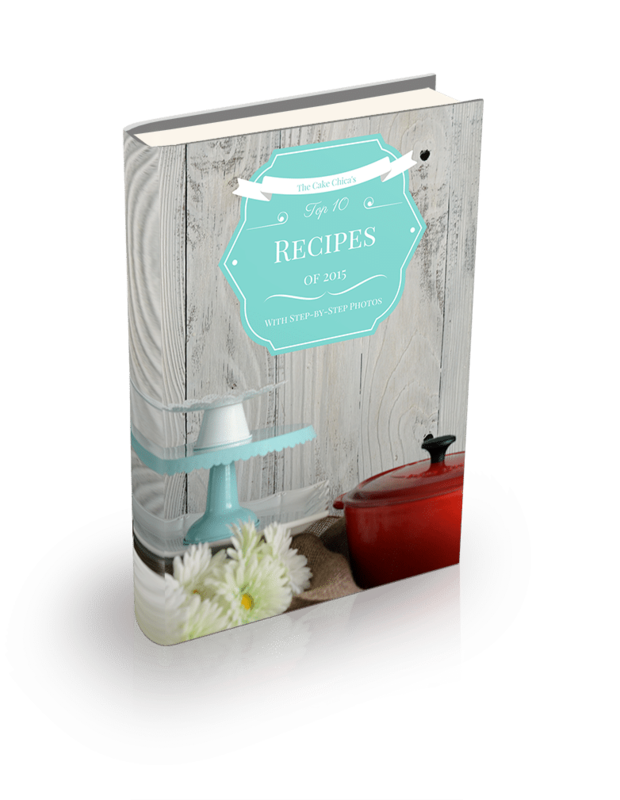 And as I thank you for signing up, you’ll receive my ebook The Cake Chica’s Top 10 recipes of 2015 for FREE! Sign up in the form below this post! Heat your oven to 350 degrees and line a large rimmed baking sheet with foil. Prick the potatoes with a fork all over and transfer to the prepared baking sheet. Bake potatoes for 30 minutes, then turn over and bake for 30 more minutes, or until tender. Let cool slightly. Meanwhile, line a large rimmed baking sheet with foil. Lightly coat the baking sheet and 2 large spoons with nonstick cooking spray. Lightly coat a large heatproof bowl with nonstick cooking spray and put brown rice cereal in the bowl. In a small bowl combine baking soda, salt, and 1/8 teaspoon cayenne pepper. In a medium saucepan, combine the sugar, 1/2 tablespoon butter and 1/4 cup water and bring to a boil, stirring until sugar dissolves. Boil over moderately high heat, swirling the pan as needed until a golden caramel forms, about 7 minutes. Remove from the heat and stir in the baking soda mixture. The caramel will foam. Immediately drizzle all of the hot caramel over the cereal and using the 2 greased spoons, quickly toss to coat. Spread the topping on the prepared baking sheet in an even layer and let cool completely, then break into small pieces. 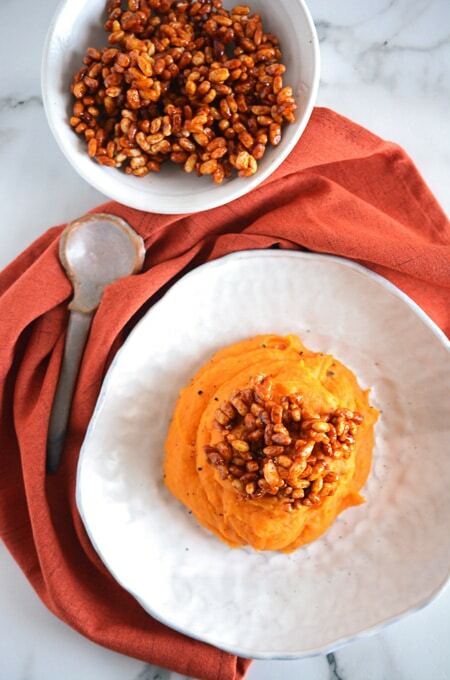 Scoop cooled sweet potato flesh into a food processor. Add the remaining 6 tablespoons butter, water, cream, orange zest and a generous pinch of cayenne and puree until smooth. Season with salt and pepper and transfer the sweet potatoes to a serving bowl. Serve, passing the crispy rice topping at the table. 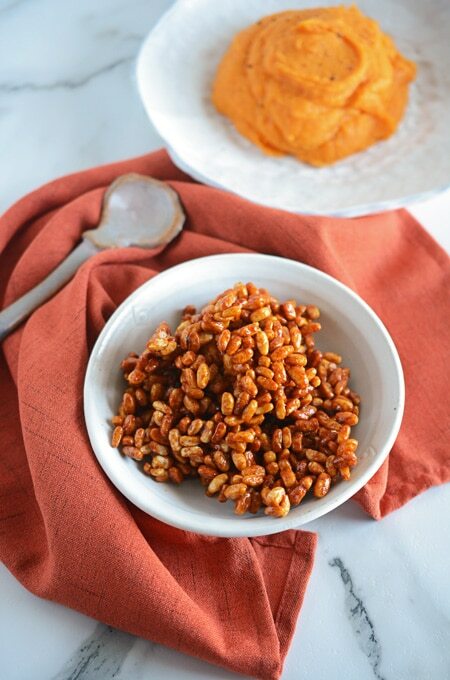 MAKE AHEAD: The pureed sweet potatoes can be refrigerated for 2 days; reheat gently before serving. The crispy rice topping can be stored in an air tight container for 1 week.